It’s rare that a car can be described as unrivalled, but that honour goes to the new Mercedes-Benz CLA Shooting Brake. Not because it’s unbeatable in its class but because, for now, no other manufacturer has bothered to make a small shooting brake. To create its rakish looks, Mercedes-Benz has blended a coupe, sports saloon and estate, resulting in a car that looks like a miniature version of the CLS Shooting Brake. It might not be quite as elegant as its bigger brother but, compared to a boring estate or predictable SUV, it makes for a refreshing alternative. Like the CLA saloon, the Shooting Brake borrows its underpinnings, engines and transmissions from the handsome A-Class. This means most of the CLA range is front-wheel drive, unlike the rear-wheel-drive C-Class. If you want all-wheel drive, it comes standard with the more performance-orientated models. And performance is something the four-wheel drive range-topping 360PS CLA 45 AMG delivers in spades. Just four different trims are available - Sport, AMG Sport, OrangeArt and Engineered by AMG (with the flagship CLA 45 AMG considered more of a standalone model). Each are well equipped and come with different styling. Worth mentioning is the extroverts-only OrangeArt trim, which has wacky orange accents on the body kit, wheels and interior for those who really want to stand out from the crowd. We've used one for our pictures here. Inside, Mercedes-Benz has so very nearly created an interior worthy of its sizeable premium over a mainstream Volkswagen Golf estate - more on that later. We love the leather-wrapped dash and door caps plus the sporty air vents, but a fingertip search discovers a few of the plastics fail to hit the mark for quality. We're also unconvinced about the centrally-mounted infotainment screen that feels like an afterthought. But at least it's clear. Sitting inside the CLA Shooting Brake makes it clear that Mercedes has made a few sacrifices to achieve those sporty looks. While it does offer 40mm more headroom than the cramped CLA saloon, you'll still find average-height adults brushing their head on the roof while rubbing their knees on the front seats. The boot is also a problem. The CLA's sporty lines have compromised both the boot's size and shape, with a high lip, narrow opening and just 495 litres of space to swallow your luggage. That's more than a hatch but far smaller than the 605 litres offered by an equivalent Volkswagen Golf estate. Mercedes does offer a bracket to increase bootspace to 595 litres, but that locks the back of the rear seats in a more forward position, ruining the comfort for anyone unfortunate enough to be sat in the rear. If you can put up with this, it's a £595 option. There's a choice of three petrol engines, a 122PS 1.6-litre turbo petrol (badged CLA 180) and two versions of a 2.0-litre turbo petrol with either 211PS (CLA 250) or an incredible 360PS reserved for the CLA 45 AMG. On the diesel side there’s the familiar 2.1-litre turbodiesel that powers everything from big vans to the luxurious S-Class. Here it develops 136PS in the CLA 200 CDI and 177PS in the CLA 220 CDI that’s expected to be the best seller. The more powerful diesel certainly delivers on paper, being able to sprint to 62mph in 8.3 seconds, while averaging an official 67.3mpg and emitting just 108g/km of CO2. Unfortunately, those numbers fail to tell the whole story. The diesel might be willing, producing its maximum torque from just 1400rpm, but it's also noisy and unrefined. Similar powerful engines BMW do the job better. Also disappointing is the reaction of the seven-speed 7G DCT dual-clutch automatic. In normal mode, the box offers flawless upshifts, but it’s slow to react to downshifts and is occasionally jerky when coming to a halt. Switch to sport mode and the transmission feels too hyperactive. It holds onto gears and is too quick to dish up a downshift. What this gearbox needs is a middle ground between the two. Unless you’re talking about the rapid CLA 45 AMG, the Shooting Brake’s unashamedly sporty looks aren’t quite reflected in the way it drives. A quick caveat - all the cars we drove were running on winter tyres. While great in cold, icy and snowy conditions, these tyres can upset the balance and reduce grip in warmer temperatures. For our drive we encountered both kinds of conditions, but found the CLA not very involving in either case. We did like the precise steering in the diesel but didn’t enjoy the surprising amount of body roll in bends that doesn’t tally with the CLA’s looks. Confusingly, Mercedes offers four different suspensions with the CLA Shooting Brake - Comfort, Lowered Comfort (that reduces ride height by 20mm at the front, 15mm at the rear), a firmer AMG Sports suspension and the bespoke set-up that comes with the fastest CLA 45 AMG. Our car had the Lowered Comfort suspension that gives the car a purposeful lowered look, but isn't very comfortable around town. The ride settled down on the motorway but, even then, the CLA is easily aggravated over the rougher surfaces that UK drivers are familiar with. We'll reserve judgement until the car has been driven on summer tyres but if you value ride comfort make sure you shop around first. Swapping for the petrol CLA 250 4Matic made for an interesting comparison. The petrol-powered engine is far more refined. It's smoother and quieter while the standard all-wheel drive means that, even in slippery conditions, traction is never a problem. Unfortunately the petrol's steering isn't as nice, with some strong self-centering steering effect that feels odd when you're used to the diesel. With its new CLA Shooting Brake, Mercedes has delivered a lot of style and some substance - at a substantial cost. 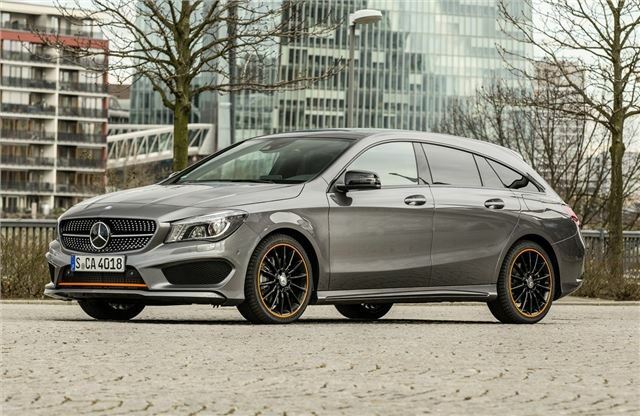 With pricing for the CLA Shooting Brake range kicking off at £25,755 for the CLA 180 and stretching to £43,120 for the sporty CLA 45 AMG, it's a long way from cheap.But for those looking for a small, stylish estate with large badge cache and just enough space, the new CLA Shooting Brake will be irresistible, even at this price.